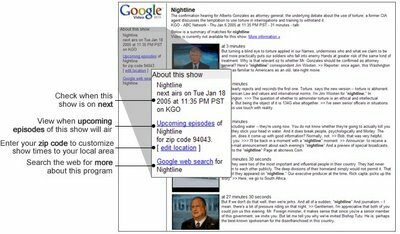 Google Video started in January 2005 as a way to search the closed captioning text of TV programs. It showed all the TV shows that talked about what you were looking for and if you selected a result, you could see all the matches of your query in the show's closed captioning. But unfortunately, you couldn't see the show. Google moved from the TV shows to the user submitted videos, but never forgot the captions. Google Video lets you add captions for your videos, but the big news is that soon you'll be able to search inside a video that has captions. That's especially useful for long videos. Instead of losing an hour watching the entire video, you'll be able to find the relevant scenes. Another new feature will be video alerts. Our company, Veotag (http://www.veotag.com), has a video "deep tagging" service does what you've discussed. Here's an example of a Veotagged video: http://www.veotag.com/player/?u=wgcqpthubc.